Joining forces with its sister hotel, the Renaissance Hamburg and York Beekeeper Michael Bauer, the Marriott is utilizing the resourceful efforts of four bee hives to create a supply of honey to service both Hamburg hotels so that Germany guests can revel in the exceptional sweetener used to enhance food and drinks served on the property. HAMBURG, GERMANY--(Marketwire - Sep 14, 2012) - Literally bringing sweet destiny to its guests, a delightful seaport hotel in Germany is serving fresh honey thanks to a colony of nearly 60,000 honey bees. With the cooperation of this exclusive colony, the Hamburg Marriott is now treating its guests to delicious "homemade" honey and adding to the sustainability of the local area. Joining forces with its sister hotel, the Renaissance Hamburg and York Beekeeper Michael Bauer, the Marriott is utilizing the resourceful efforts of four bee hives to create a supply of honey to service both Hamburg hotels so that Germany guests can revel in the exceptional sweetener used to enhance food and drinks served on the property. The hives are housed in the roof of the Renaissance Hamburg and have been buzzing with activity and enjoying wonderful city views since late May. "At the Marriott, we are constantly striving to increase our involvement in sustainability," said Peter van Rossen, director of both hotel properties. "We take great care to offer local products and work with companies or dealers that support the surrounding area." In providing the bees with accommodation in Hamburg, the expertise of Bauer was sought and a perfect home was chosen for the busy creatures taking four factors into consideration: location, nectar environment, wind direction and main vibration. Also taken into consideration were flower-pollinators within a radius of two to three kilometers and nectar sources of trees and shrubs. With everything in place, the bees are expected to produce up to 35 pounds of Natural Honey annually. "We were delighted to give the bees a nice new home so we can provide our guests with delicious honey," added van Rossen, who became excited about the project after learning about trend and its impact on sustainability. The director also noted the "hotel bees" pose no danger to guests of the Hamburg accommodation, only sweet benefits when dining on site or enjoying room service from the hotel's selection of fine eating establishments. Open daily for breakfast, lunch and dinner, Speicher 52, the hotel's signature restaurant in Hamburg, Germany, features new nordic cuisine and the hotel's own natural Honey. Guests can also enjoy three daily meal offerings at the Piano Bar, where afternoon and evening drinks are popular and live piano music is featured Tuesday through Saturday. The Lobby Lounge serves a variety of delicious snacks and drinks for lunch and dinner inside the hotel's roomy lobby, adding to the choice of convenient Hamburg restaurants Germany visitors can choose from for delectable on-site dining. 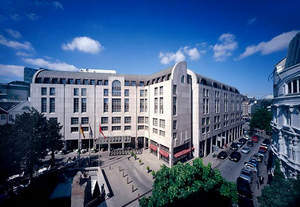 The Hamburg Marriott Hotel welcomes guests to bold sophistication amidst the vibrant charm of Hamburg's city center and surrounds them with opulent amenities, grand hospitality and an extensive choice of elegant accommodations. Offering well-appointed guest rooms, spacious suites and executive level lodging, guests are sure to find accommodations to meet their needs whether traveling to Hamburg for business or leisure. Conveniently located near the train station, prominent shopping, art galleries and other popular Hamburg destinations, the hotel provides travelers with everything needed for a phenomenal hotel experience.